The RCEP was built upon the existing ASEAN+1 FTAs with the spirit to strengthen economic linkagesand to enhance trade and investment related activities as well as to contribute to minimising development gap among the parties. Greater access to Chinese goods may have impact on theIndian manufacturing sector. India has got massive trade deficitwith China. The bilateral trade deficit has risen exponentially. This surge in Chinese imports from electrical and electronic goods, plastics, chemicals, boilers and mechanical appliances to toys and stationery items has undeniably hurt Indian manufacturing, without helping it move up the technology and productivity ladder. There are demands by other RCEP countries for lowering customs dutieson a number of products and greater access to the market than India has been willing to provide. The RCEP is led by China, with the 10 ASEAN countries, Australia, New Zealand, India, Japan and South Korea as partners. India’s trade engagement with these countries has not been favourable, when seen in terms of the trade deficit. Recent NITI Aayog note on Free Trade Agreements and their costs points out that India’s trade deficit with the RCEP group (it already has FTAs with the ASEAN, South Korea and Japan) has risen from $9 billion in 2004-05 to over $80 billion today. Given the discontent over lack of jobs and agrarian distress, with the general elections less than a year away, this cannot be an opportune time to throw open sensitive sectors such as dairy products. Many countries want India to open up its market for 92% of traded goods, while India is only ready to offer market access up to a maximum of 85% items with deviations for countrieslike China, Australia and New Zealand with whom it does not have an FTA. On the other hand, New Zealand’s export-oriented dairy products will decimate India’s growing dairy sector, which is still largely small-scale. IP chapter in RCEP is at risk of including provisions far stricter than those mandated by the World Trade Organisation (WTO)and the Agreement on Trade-Related Aspects of Intellectual Property Rights (TRIPS). E-commerce commitments, if any, will allow companies such as Alibaba from China to displace Indian manufacturing especially in the SME segment. Agreeing to data exclusivity, extending patent terms and unduly strong enforcement measures will weaken the entire generic medicine sector and take away several health safeguards in India’s Patent Act, notably section 3(d). This will make medicines inaccessible not only for Indian patients but for those in the entire developing world. If India offers to reduce/eliminate import tariffs on a larger number of industrial products than already committed to Asean, Japan and South Korea, its industrial sector could be under stress. More developed countries such as Australia and Singapore are unwilling to accommodate India’s demands to liberalise their services regimeand allow freer mobility of Indian workers. Given India’s inability to negotiate a good services deal in the past, RCEP negotiations, especially with China, need a second thought. It has the potential to overthrow India’s policies of rural development and industrialisation especially ‘Make in India’, and to provide accessible healthcare and medicines to all. It also threatens the policy flexibility and sovereignty to pursue independent economic, social and environmental policies. Under the ambit of RCEP, countries like China, South Korea and Japan are manufacturing powerhouses, and Australia and New Zealand have strengths in processed foods, wine, and dairy products, while Asean has comparative advantages in plantations, electronics and auto-components. India’s steel ministry has strongly opposed the inclusion of finished steel products in the proposed regional free-trade agreement, saying it would have an adverse impact on the industry that’s recovering from a crisis. India believes an ambitious services deal will help it provide job opportunities in RCEP member countries for its millions of skilled professionals at home. RCEP agreement would complement India’s existing free trade agreements with the Association of South East Asian Nations and some of its member countries, as it would deals with Japan and South Korea. It can address challenges emanating from implementation concerns vis-à-vis overlapping agreements, which is creating a “noodle bowl” situation obstructing effective utilization of these FTAs. The RCEP would help India streamline the rules and regulations of doing trade, which will reduce trade costs. RCEP will facilitate India’s integration into sophisticated “regional production networks” that make Asia the world’s factory. The RCEP is expected to harmonize trade-related rules, investment and competition regimes of India with those of other countries of the group. Through domestic policy reforms on these areas, this harmonization of rules and regulations would help Indian companies plug into regional and global value chains and would unlock the true potential of the Indian economy. It will also reduce the overlap among Asian FTAs. Before getting into any multilateral trade deal, India should review its existing FTAs in terms of benefits to various stakeholders like industry and consumers, trade complementarities and changing trade patterns in the past decade. Negotiating bilateral FTAs with countries where trade complementarities and margin of preference is high may benefit India in the long run. Also, higher compliance costs nullify the benefits of margin of preference. Thus reducing compliance cost and administrative delays is extremely critical to increase utilisation rate of FTAs. Proper safety and quality standards should be set to avoid dumping of lower quality hazardous goods into the Indian market. Developing countries like India which have taken the leadership in instituting and using balanced intellectual property protection for pharmaceuticals should not only proudly protect their laws in the RCEP negotiations, they should also encourage other countries to adopt and use similar measures that ensure generic competition. Before going ahead with any of the mega trade deals, India needs to aggressively undertake a few of the pending reforms. These include domestic as well as trade reforms like changes in land and labour laws especially in sectors like textiles and reduction in subsidies are crucial as RCEP would bring in investment in several labour intensive sectors including textile. Sanitary & phytosanitary issues and technical barriers to trade measures are the most frequently used against Indian exports. Thus the non-tariff barriers in RCEP countries should be negotiated transparently before negotiating market access. RCEP has the East Asian economies as partners, who have thrived on export-led growth model, unlike India whose domestic economy is its strength. Therefore India should choose a model that will complement this setup. India also needs to introspect as to what it can get from negotiating the proposed RCEP that it has not already obtained from prevailing trade agreements. Swachh Bharat is an important scheme of GoI to improve the hygiene and public health in India. The scheme has noble objectives but its implementation raises the concerns of the sanitation workers and their working conditions which in turn affects the efficacy of the programme. The question wants us to delve deep into the Swachh Bharat mission and probe how its success can be ensured only when stigmas attached to sanitary labour are addressed. Here we have to bring out the concerns of the labour and how it affects the Swachh Bharat mission. Introduction- Write a few lines about SBM and its vision- to achieve a clean and Open Defecation Free (ODF) India by 2nd October, 2019. Mention the objectives of- motivating communities to adopt sustainable sanitation practices and facilities through awareness creation and health education, and to create significant positive impact on gender and promote social inclusion by improving sanitation especially in marginalized communities. Mention that municipalities employ contractual labourers for SBM— mostly scavengers forced into the profession by their caste — to remove waste; The SB campaign burdens the contractual labourer with an ‘exclusive’ right to cleaning public spaces, while making it a voluntary act for the ‘public’ to not defecate, urinate or litter in random spaces; this reinforces the marginalization and stigmatization of such labourers; The Swachh Bharat campaign hardly addresses a reworking of the underground sewerage system due to which many such labourers have died recently while cleaning jammed manholes that open into the sewerage system etc. Conclusion- bring out the need for caste-neutralising these professions and adoption of technologies and adequate safety measures in order to make SBM successful not only for the most of India but also for the sanitation workers whose efforts and toil go largely unnoticed. Swachh Bharat Mission is a campaign which was launched on 2 October 2014, and aims to eradicate open defecation by 2019, and is a national campaign, covering 4,041 statutory cities and towns. Its predecessors were the “Nirmal Bharat Abhiyan” and before that the “Total Sanitation Campaign”. Recent Parliamentary Committee report clearly says this programme is unlikely to make India open-defecation free. The rationale of the 51st Standing Committee on Rural Development report is that even a village with 100 per cent household toilets cannot be declared open defecation-free till all the inhabitants start using them. A sense of responsibility has been evoked among the people through the Clean India Movement. With citizens now becoming active participants in cleanliness activities across the nation, the dream of a ‘Clean India’ once seen by Mahatma Gandhi has begun to get a shape. So far, 248,000 villages have been revived from the disgrace of open defecation; 203 districts, over one-third of the total, have banished open defecation. Five States have declared themselves Open Defecation Free (ODF) in rural areas: Sikkim, Himachal Pradesh, Kerala, Uttarakhand and Haryana. If successful, this campaign can transform the lives of Indian women, bringing in its scope issues of women’s safety, their access to higher education and will even challenge the caste system. The key reason for this is that basic latrines that need to be emptied out manually or pumped by simple machines are unacceptable to higher caste Hindus. It is considered polluting to the individual and the home, and historically associated with untouchability. So people rather defecate in open than having a toilet at home. It is not just a matter of access but a problem of perceptions of pollution, ritual purity, and caste. Even if the government builds free toilets without any leakage or corruption, India will at best have 80 million new toilets that a large proportion of Indians do not want to use. Municipalities began to employ more contractual labourers mostly scavengers forced into the profession by their caste to remove waste. The Swachh Bharat campaign hardly addresses a reworking of the underground sewerage system due to which many such labourers have died recently while cleaning jammed manholes that open into the sewerage system etc. India has far higher levels of open defecation than other countries of the same GDP per capita. For example, India has a higher GDP per capita than Bangladesh, but in Bangladesh only 8.4% households defecate in the open, compared to 55% in India. Parliamentary Committee recommends the government to review its data time to time and delete the number of defunct toilets from the list to have a real picture of constructed and functional toilets in the country. Deeply entrenched cultural contexts must be taken into account for successful policy outcomes. India needs to change perceptions of ritual purity through education and awareness in rural areas. This can be done by investing in sewage systems. A toilet that flushes away human waste into the sewage and waste management system solves the problem. If there is a functional sewage system, it is relatively low cost for households to build a toilet in every home that is connected to the sewage system. Developing proper sewage system in village would also have wider impact with water not stagnating any more, lesser vector borne diseases etc so the wider objective of sanitation will be achieved. Also it would not put stress on manual scavengingand this occupation can slowly fade away giving sense of dignity and equality to the most vulnerable sections. Villages have very small houses and much clustered places where there is no place to construct toilets. The ideal solution is to have mohalla toilets designated to each house where people will keep their toilet clean by seeing others. One advantage is that when the toilets are outside the home, there will be a peer pressure to keep it clean. There should be a proper databaseabout what are the requirements in a particular area because we cannot force a toilet in a house where there is no place. For India constructing toilets is like a social work and not a development work. Once it is seen as a development work with country’s image, then the thrust will come and the people will realise how important it is and we should not lag behind other countries. In schools it is the responsibility of the teachers and they have to be oriented to ensure that the child knows about hygienewhich also includes knowing how to use a toilet. Pursuit of Swachh Bharat also requires strengthening public health services. Services such as good drainage systems, absence of swamps and ponds that are home to stagnant water, and the supply of safe drinking water all of which reduce exposure to and spread of diseases are classic examples of public goods and require effective government intervention. The article discusses the various reasons for the severity of Kerala floods and the role that dam mismanagement played in accentuating the crisis in Kerala. Understanding the issues related to dam management in Kerala can be extrapolated to other states. The question is thus important for geography section of Paper 1. The question expects us to underline in brief the various causes why floods in Kerala were so severe. Thereafter we need to delve deeper into the issue of dam management, the lacunae in our policy, suggestions made by several committees and the way forward. Introduction – emphasize on the severity of rainfall battering Kerala State. Body – Explain in brief the various factors that enhanced the severity of floods in Kerala. Explain the issue of dam mismanagement in detail, the associated reasons that it happens etc. Explain the view of several committees formed which held that mindless construction of dams leads to several issues like earthquakes etc. Conclusion – Summarize the lacunae in our policy and discuss the way forward. Recently incessant rains in the past couple of weeks has caused massive flooding across Kerala. India’s western coast has received above-average rainfall on account of sustained low-pressure conditions. Injudicious use of land is responsible for making some regions of the state more prone to floods and landslides. However, other factors such as a change in land use patterns and climate change could have contributed to the situation on the ground. Incursions into catchment areas of rivers that have dried up and mountainous areas have rendered settlements in their vicinity vulnerable to the vagaries of nature. Kerala is yet to implement recommendations of the Gadgil Committee on conservation of Western Ghats. The state is an exception that it does not have a single batallion of SDRF task force which is mandatory as per rules to tackle natural calamities. India’s Central Water Commission has also been under fire for failing to introduce a flood forecasting system to issue warnings. Recent research indicates that rising temperatures have led to huge fluctuations in the monsoon winds carrying the moisture from the Arabian Sea, resulting in heavy-to-extreme rains over the Western Ghats and central India, lasting for two to three days. Unfettered development activity in the Western Ghats had increased the chances of landslides, a major cause of casualties during the floods. Wetlands have been lostto development projects, construction of roads, and buildings at places too close to rivers. Kerala is home to 53 large dams with a collective capacity of nearly 7 trillion litres. As rain poured and rivers overflowed, these dams should have served as a bulwark. But for dams to truly tame floods, experts say dam reservoirs need to be relatively empty before the onset of rain. This was not the case in Kerala. When the downpours arrived in August, the near full-capacity Idukki was forced to release water into already flooded areas. Also state did not gradually release water from about 30 dams in anticipation of rains. Local officials have been blamed for exacerbating the situation by failing to gradually open the dams dotting the state’s complex river network, waiting instead until they were already full before unleashing the excess water. Like many dams in India, the Mullaperiyar is located in one state (Kerala), but operated by another (Tamil Nadu). Both state governments have been in constant conflict over the dam’s water level in the current crisis, the Supreme Court had to intervene. As per the 2017 CAG report, Kerala had not conducted a dam-break analysis or prepared an Emergency Action Plan. Neither has the state prepared the Operation and Maintenance (O&M) Manuals for any of its dams. The audit also observed that prescribed quality checks were not conducted by monitoring agencies in all four projects in Kerala. Kerala should relook the Gadgil committee and the Kasturirangan committee reports. It has put forth objections to both reports and tried to reduce the area under ecologically sensitive zones (ESZs). It is time for it to re-evaluate its position regarding ESZs. The Gadgil panel report calls for government intervention to curb activities such as quarrying, mining, land clearance or construction in ecologically-sensitive zones such as those close to riverbanks and violation of Wetlands Protection Rules too need to be looked into. Kerala should set up a State Flood Commission to evolve a comprehensive approach to manage extreme rainfall in the state. This commission should examine the impact of major land use changes on the hydrology of the state. It should also look at the dam management systems. Besides this, district-level sub-commissions should be set up to identify the areas where roads, railways, hydropower, embankments and other infrastructure projects aggravated flood problems and suggest mitigation measures. As a country, India needs to improve environmental governance while working with other countries to halt global warming. Flood control can be effected through an Integrated Dam Management System, which is totally computerised and automated, the only exception being lifting and lowering of shutters which has to be done manually. This system which can be called IDMS, has to be evolved and developed independently. Integrated approach to managing floods requires a sound understanding of the patterns that rivers such as the Ganga and its tributaries display during the monsoon. Governmental understanding of the problem generally relies not so much on advanced techniques such as mapping based on satellite imagery and Geographic Information Systems, but on ground-level surveys and anecdotal reporting. This needs to change. Climate change is a global and a vital issue having implications for all the communities and all the ecosystems. Given its potentially drastic and dangerous consequences it is important to educate people about the issue and also to build their resilience against natural disasters whose frequency is only going to increase in the coming years. The question wants us to write in detail about the forecasts for climate change and its potential hazards. We have to bring out the need to educate and equip both rural and urban communities to build resilience against natural disasters. We also have to briefly discuss the strategy to do so. Introduction- write a few lines about climate change and the temperature forecasts for the century, vulnerability of all societies and ecosystems, especially those inhabited by the poor to the disastrous effects of climate change. Bring out the need to educate people about the possible implications and involve and equip them in building resilience against disasters. Mention the limited capacity of the government in tackling the climate change. Discuss how to build resilience against disasters. E.g compulsory environmental education to all students in schools and colleges; Corporate organisations, research and education institutes, NGOs and foundations have committed themselves to educating people about climate change and providing the know-how for mitigation, adaptation and resilience building. Both these initiatives have already been taken and have proven insufficient. Discuss what more can be done. E.g need to incorporate climate change to be articulated and specified as an activity for CSR, rather than be implied in the umbrella term of environmental sustainability; Scaling up current initiatives of the corporate and social sectors to regional or national levels etc. The UN Sustainable Goals Report, 2018 notes that climate change is among the key factors in rising hunger and human displacement. The World Health Organisation estimates that climate change will cause an additional 250,000 deaths per year between 2030 and 2050, due to malnutrition, malaria, diarrhoea and heat stress. The World Bank projects that climate change could cost India 2.8% of its GDP, and diminish living standards for nearly half the country’s population, in the next 30-odd years. Climate change education offers a valuable opportunity to combat climate change. It gives children and young people the knowledge and skills to make informed decisions about how to adapt individual lives and ecological, social or economic systems in a changing environment. Education plays a vital role in bringing about behavioral change, and schools can play an important part by becoming carbon neutral, energy efficient and reducing their own ecological footprint. Compliance of Nationally Determined Contributions in Paris Agreement for reaching reduced level of greenhouse emissions so as to limit the rise in temperature to 2°C, and to 1.5°C in the extreme case, would need greater participation from all sectors of the economy, be it industry, household or farming. Globally, climate change education has been discussed in various negotiating platforms of the UN Framework Convention on Climate Change. How to make the communities educated about climate change and make them resilient against disasters ? Corporate organisations, research and education institutes, NGOs and foundations have committed themselves to educating people about climate change and providing the know-how for mitigation, adaptation and resilience building. These initiatives target urban and rural populations including schoolgoing children. Their thrust ranges from inculcating the concept of environmental sustainability to driving home the impact of climate change on food, water, nutrition and health. Scaling up current initiatives of the corporate and social sectors to regional or national levels etc. At present, climate change does not find specific mention in Schedule VII of the Companies Act, 2013. However, if it were to be articulated and specified as an activity for corporate social responsibility (CSR), rather than be implied in the umbrella term of environmental sustainability, organisations may be encouraged to view it with increased importance and clarity and lend more weight to creating awareness, mitigation and resilience-building. Film industry could consider ways to incorporate key aspects of climate change in films, writers could introduce climate change in adult and children’s literature, and gaming companies could develop games on this theme. The Science Express Climate Action Special, an innovative mobile science exhibition travelling thousands of kilometers to create awareness has taken shape under the guidance of the department of science and technology. At the school levels the Center of Environment Education has been creating awareness. The concept of increasing ‘hand print’ for action towards sustainability, as against reducing carbon footprint for mitigation of climate change is being evolved. Capacity building for strengthening roots or mentoring to build resilience is more recent. The Climate Change Research Institute through its research in the energy sector, are working on capacity building among the youth in schools (K12) and colleges. This needs to be expanded further. Climate change education for awareness, capacity building and innovation is still in a nascent stage and should become part of the structured education. Find a way to help mitigation of climate change through of science, technology and innovation. Climate Change Education will help not only in ‘development’, which is core objective education, but also in ‘sustainable development’. Problem solving innovations in developing clean energy alternatives, in improving farming techniques, in water resource management and others are possible by building technical knowledge mainstreamed in the formal education. India is one of the few major democracies in the world without a national privacy and data protection framework. The absence of this was noted in the Supreme Court’s famous Puttaswamy ruling which clarified that there is a fundamental right to privacy, and also, that the state has an obligation to protect this right by enacting appropriate legislation. The draft data protection bill appears to provide massive exceptions for welfare that seemingly apply to Aadhaar. Section 13 makes the processing of personal data without a person’s consent possible for any function of the Parliament or State Legislature. It allows the processing of personal data, if necessary for the exercise of any function, for the delivery of services or benefits or issuance of certificates. The Bill provides exemptions from compliance with its provisions, for certain reasons including: (i) state security, (ii) prevention, investigation, or prosecution of any offence, or (iii) personal, domestic, or journalistic purposes. While the Aadhaar Act posits itself as an act to provide for, as a good governance, efficient, transparent and targeted delivery of subsidies, benefits and services, its expansion into various other fields has been unchecked and indiscriminate. The processing of Aadhaar data so far has been for purposes that are anything but clear and specific. In the case of Aadhaar authentications for the elderly, differently abled, those engaged in manual labour, people genetically predisposed to not have fingerprints Aadhaar-based biometric authentication does not work. The draft bill and report propose a new system of offline verification. As per section 2(13) of the bill, a “data fiduciary” means any person, including the state, a company, any juristic entity or any individual who alone or in conjunction with others determines the purpose and means of processing of personal data.” This would mean possibly, that the burden of maintaining data quality would be placed on the UIDAI, and not on the data subject. The draft bill defines sensitive personal data to ordinarily include biometric data and that such sensitive personal data usage by the state without consent can only be authorised by a law or explicitly mandated by law, under clauses 19 and 20. Even for processing sensitive personal data with consent, the draft bill lays down that such consent must be free, clear, explicit, informed, specific and capable of being withdrawn. It is not valid consent when people are made to enrol for Aadhaar on a threat of denial of any service or benefit, for example. In recognising the principle of collection and purpose limitation obligations in clauses 5 and 6, Aadhaar’s regime also receives the committee’s rebuke. From allowing registrars to collect several additional fields and create their own resident profiles in the State Resident Data Hubs (SRDH), to opening the Aadhaar platform to be used by anyone for any purpose mission creep was the modus operandi for UID ubiquity. Committee has recommended two changes to the Aadhaar Act. The report states amendments have been suggested that classify requesting entities into two kinds to regulate access to personal data on the basis of necessity those who can request for authentication and those who are limited to verifying the identity of individuals offline. In other words, the committee wants better safeguarding of Aadhaar data. The committee has said amendments are required to ensure the autonomy of the UIDAI. The committee said the UIDAI must be equipped with powers akin to a traditional regulator for enforcement actions. Clouds are made of water droplets or ice crystals that are so small and light they are able to stay in the air. The water or ice that make up clouds travels into the sky within air as water vapour. Water vapour gets into air mainly by evaporation as some of the liquid water from the ocean, lakes, and rivers turns into water vapor and travels in the air. When air rises in the atmosphere it gets cooler and is under less pressure. When air cools, it’s not able to hold all of the water vapor it once was. Air also can’t hold as much water when air pressure drops. The vapour becomes small water droplets or ice crystals and a cloud is formed. It’s easier for water vapour to condense into water droplets when it has a particle to condense upon. These particles, such as dust and pollen, are called condensation nuclei. Eventually, enough water vapour condenses upon pieces of dust, pollen or other condensation nuclei to form a cloud. Some clouds form as air warms up near the ground and rises. Heated by sunshine, the ground heats the air just above it. That warmed air starts to rise because, when warm, it is lighter and less dense than the air around it. 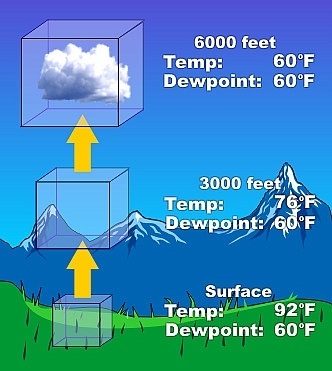 As it rises, its pressure and temperature drop causing water vapor to condense. Eventually, enough moisture will condense out of the air to form a cloud. Several types of clouds form in this way including cumulus, cumulonimbus, mammatus, and stratocumulus clouds. Some clouds, such as lenticular and stratus clouds, form when wind blows into the side of a mountain range or other terrain and is forced upward, higher in the atmosphere. This can also happen without a dramatic mountain range, just when air travels over land that slopes upward and is forced to rise. The air cools as it rises, and eventually clouds form. Other types of clouds, such as cumulus clouds, form above mountains too as air is warmed at the ground and rises. At a cold front, where heavy cold air mass pushes a warm air mass upward, cumulous clouds are common. They often grow into cumulonimbus clouds, which produce thunderstorms. Nimbostratus, stratocumulus, and stratus clouds can also form at cold front. Topic – Information sharing and transparency in government, Right to Information, Codes of Ethics, Codes of Conduct, Citizen’s Charters, Work culture, Quality of service delivery, Utilization of public funds, challenges of corruption. Both of these are important concept which share some similarities and several differences which need to be discussed upon. The question wants us to simply bring out in detail the differences between the Code of Ethics and the Code of Conduct. Introduction- Mention that both Code of Ethics and Code of Conduct are similar as they are used in an attempt to encourage specific forms of behaviour by employees. However, the two have several differences between them. Discuss the differences between the two. E.g define both the terms in order to clarify their meaning. An aspirational document, issued by the higher level management/ board of directors containing core ethical values, principles and ideals of the organization is Code of Ethics while as a directional document containing specific practices and behavior, that are followed or restricted under the organization is Code of Conduct; the former is general and wide in nature while as the later is specific and narrow in range; COE governs decision making while as COC governs actions; Code of Conduct are originated from the code of ethics, and it converts the rules into specific guidelines, that must be followed by the members of the organisation;COE is focussed on values and principles while as COC is focussed on compliance and rules etc. Codes of ethics, which govern decision-making, and codes of conduct, which govern actions, represent two common ways that companies or organisations self-regulate. It defines the minimum requirements for conduct, and behavioural expectations instead of specific activities. For example if an organization is committed to protecting the environment and “being green”, the Code of Ethics will state that there is an expectation for any employee faced with a problem, to choose the most “green” solution. When faced with ethical dilemmas or debatable situations, what’s articulated in the Code of Ethics can help guide decision making. A Code of Conduct applies the Code of Ethics to a host of relevant situations. A particular rule in the Code of Ethics might state that all employees will obey the law, a Code of Conduct might list several speciﬁc laws relevant to different areas of organizational operations, or industry, that employees need to obey. The Code of Conduct outlines specific behaviours that are required or prohibited as a condition of ongoing employment. It might forbid sexual harassment, racial intimidation or viewing inappropriate or unauthorized content on company computers. Both are used in an attempt to regulate behavior in very different ways. Ethical standards generally are wide-ranging and non-specific, designed to provide a set of values or decision-making approaches that enable employees to make independent judgments about the most appropriate course of action. Code of ethicsis a set of principles which influence the judgement while the Code of conduct is a set of guidelines that influence employee’s actions. Code of Ethics is general in nature, whereas code of conduct is specific. Code of Conduct are originated from the code of ethics, and it converts the rules into specific guidelines, that must be followed by the members of the organisation. Lengthwise, code of ethics is a shorter document than a code of conduct. Code of Ethics regulates the judgment of the organisation while a code of conduct regulates the actions. Code of Ethics is publicly available, i.e. anyone can access it. Conversely, Code of Conduct is addressed to employees only. Both a Code of Ethics and a Code of Conduct are similar as they are used in an attempt to encourage specific forms of behaviour by employees. Ethics guidelines attempt to provide guidance about values and choices to influence decision making. Conduct regulations assert that some specific actions are appropriate, others inappropriate. Code of Conduct is actually extracted from the Code of Ethics. Therefore, the latter concept is wider than the former. Moreover, these codes are beneficial for businesses of any size and nature as the codes lays down direction which is helpful for employees, to behave in a particular manner and also making a public image of ethical behaviour. Previous story Insights MINDMAPS: “India’s First Drone Policy”.